Whether cooked or raw, ground beef and ground chuck look so similar to each other. In fact, it is almost impossible to tell them apart without looking at the label. So if they’re so similar, can you use ground chuck as a substitute to ground beef and vice versa? This article will discuss the difference between ground beef and ground chuck, and you can find out! Ground beef refers to regular ground beef. It is finely chopped and is usually from inexpensive cuts such as brisket or shank. It may also contain artificial preservatives, fat trimmings, and seasonings to enhance the flavor. Ground beef has a fat content of approximately 25% to 30%. Because of its high fat content, it is very juicy and shrinks when cooked. Ground beef or regular ground beef is the most affordable type of ground beef. It is also the most readily available at meat shops and supermarkets. It cooks easily and is extensively used in hamburgers, meatloaf, tacos, sausages, lasagna, spicy kofta, meatballs, and cottage pies. On the other hand, ground chuck is ground beef from primal cuts like the shoulder area. Some manufacturers label it as “lean ground beef.” It has about 15% to 20% fat. Ground chuck is a bit dry because of its low fat content. However, many people prefer ground chuck for its mild flavor. It is used in hamburgers, spaghetti bolognese, meatballs, picadillo, and other ground meat based dishes. What, then, is the difference between ground beef and ground chuck? The greatest difference between the two is that ground beef is from inexpensive cuts (like brisket or shank) whereas ground chuck is from the shoulder area, a primal cut. This also means that ground beef is cheaper than ground chuck. Ground beef contains a higher fat level (25% to 30%) than ground chuck (15% to 20%). 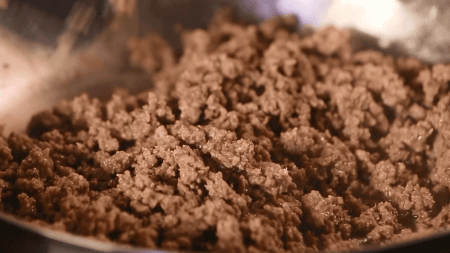 This is why many people say ground beef is juicier and more flavorful than ground chuck. Both regular ground beef and ground chuck are forms of ground beef, but whether they are interchangeable or not depends on your personal budget and taste.